These detailed figures are well painted with belts, kerchiefs, suspenders, and a variety of hats. I know the little people in my sets will find their way onto my layout and add life to my scenes. If you haven’t seen our o scale figures in person yet you can catch us at the upcoming 33rd National Narrow Gauge Convention in Pasadena. We’ll be at tables 157 and 157A with these figures plus some of our buildings which have been out of production for years. In the mad rush to get ready for this great show we are scanning our current product lines so that we can have them available in other scales. Our G Scale customers might recognize Flo (pictured in O Scale to the left), she has been shrunk! 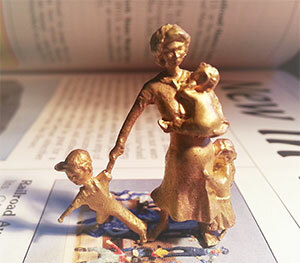 Our most difficult (so far) scan and print, finished in beautiful brass. Many more are in the works and in the coming weeks we’ll be posting a video showing how we scan and work on the figures, so stay tuned for that. Stay tuned for the upcoming video showing our process, if you want to get notified when it comes out sign-up for our O Scale Newsletter on the top right of this page. Hopefully we’ll see you at the National Narrow Gauge Convention coming up!